This section contains documents and resources to help you in managing your grant; and to understand what comes next. We wish you success with your funded project, and look forward to hearing about your progress – both in the formal reporting we ask for as part of our terms and conditions, and from your press cuttings, announcements and pictures, which we are happy to receive by email at any time. 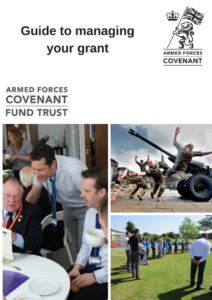 The Armed Forces Covenant Fund Trust can only achieve its objectives through the programmes and projects that we support – that is, through you, the organisations to which we award grants. If your project is complex and involves a number of partners who are helping you to deliver your work; particularly if they are receiving part of your grant or if your project could not go ahead without them, then you’ll need to develop a partnership agreement; which we’ll need to see a draft version of. We’ve produced some partnership agreement guidance. You might also like to think ahead to the end of your grant, particularly if you have received a grant under our Armed Forces Covenant Local Grants priority. This is some information on the questions that we will ask you at the end of your grant. If you have a larger grant; we will talk with you about your milestones. Do you have an award under the Armistice and Armed Forces Communities Programme? Please go to our dedicated section to help you manage your award.